Above,. Pinktastic Mini petunia; Wild Romance Red New Guinea impatiens; and Angelface Steel Blue Summer snapdragon. Below, Colorblaze Golden Dreams coleus; and Electric Sunshine tickseed. All photos courtesy the introducers. Each year about this time the trade magazine Landscape Trades (published by the trade organization Landscape Ontario) previews some of the new introductions that Canadians gardeners will see available in their favourite garden centres. The first five of such for 2019 are listed here, and I shall likely carry on with another five annuals in the coming weeks. 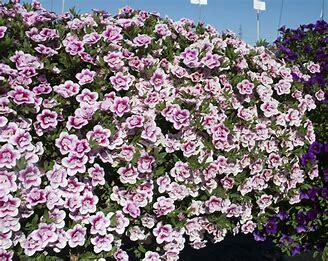 Discover this Calibrachoa’s completely new three-dimensional colour pattern! Double PinkTastic from Selecta one, truly catches the eye thanks to two bicoloured pink-white circles of inner petals in each flower. 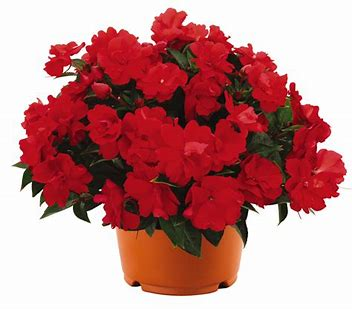 MiniFamous® Double PinkTastic looks spectacular as a stand-alone item in a pot, but also works wonders in combined containers. Flowering from spring until autumn, this beauty with its novel bicoloured pattern produces new flowers over and over again and provides a fabulous summer backdrop. Throughout the contest the FleuroStar judges in Europe were enchanted by the trendy pink-white colour combination and the bi-coloured inner petals sparking off comments such as: ‘Each flower looks like a mini-rose and is a single work of art’. Supported by the international retail experts on the judging panel who almost unanimously predicted high commercial potential for this Calibrachoa, the FleuroStar 2017/18 was awarded to PinkTastic. The plant bears all fully double and two toned pink and white blooms that are about 2 cm in diameter. My second pick for next spring is a red New Guinea Impatiens (Impatiens hawker Wild Romance). The series included one with blush pink and one with white flowers. The originating seed company was from England: Drummen Orange. Now for this year they are adding ‘Wild Romance’. Last year, they introduced the novel Wild Romance series, featuring flowers that resemble a rose as the bud opens and a gardenia when fully open. Now, Wild Romance Red joins the existing Blush Pink and White. My third new plant for next spring in the ‘Annual’ category is Angelonia angustifolia or Angelface Steel Blue Summer snapdragon. 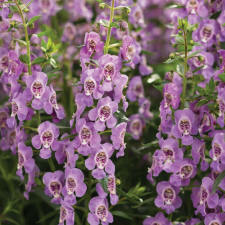 Angelface® Angelonia are prized as vertical accent plants everywhere. 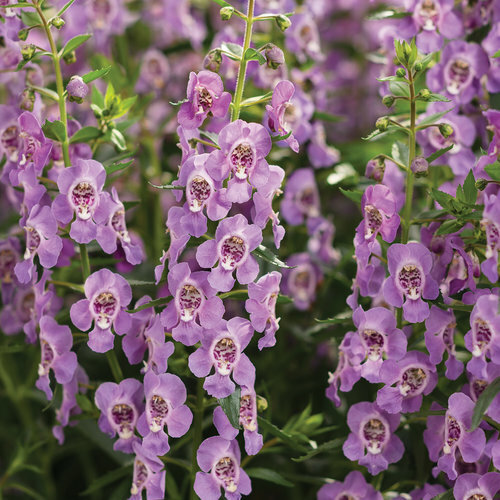 Undoubtedly the finest Angelonia on the market today, Angelface are semi-upright with a good branching habit, have extra-large, brilliantly colored blooms, and thrive in hot, humid conditions. 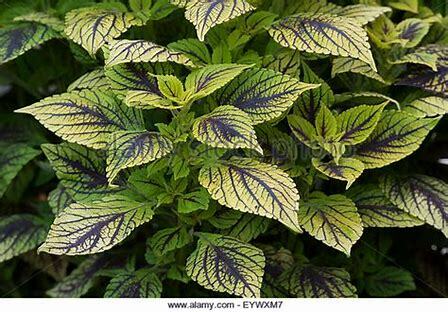 My fourth new annual for next spring is Golden Dreams coleus (Solenostemon scutellarioides). Solenostemon scutellarioides is native to southeast Asia and Malaysia. Growing to 60–75 cm (24–30 inches tall and wide, it is a bushy, woody-based evergreen perennial, widely grown for its highly decorative variegated leaves. It has been assiduously hybridized over the years into a very large number of vegetatively propagated and seed propagated strains with an almost infinite number of leaf colour combinations including most colours of the spectrum except true blue. Although Solenostemon scutellarioides plants are perennials, many growers treat them as temporary foliage plants, to be enjoyed and then discarded when past their best. This is because they are sometimes difficult to overwinter and also because they are easy to grow from cuttings. Their soft, rather thin leaves very considerably in shape, size and colour (which can be almost any shade of yellow, red, orange, green or brown or a mixture of three or more of these. Solenostemon scutellarioides plants have opposite leaves and blue to lilac colored flower spikes. Such flowers as they produce have little decorative value and are best nipped out when they are still developing; this procedure will help to keep the plants bushy. Solenostemon scutellarioides has the most incredible foliage with colours and colour combinations that no other plant species can offer. The leaves are gorgeous with their frilly edges and unique colour patterns. These plants are easy-care, versatile and their foliage colour, again, can only be described as spectacular! They combine well with flowering annuals to create more texture and interest or it is a great stand-alone in a container or bed. 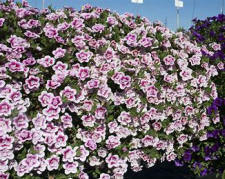 These plants can be used for group or mass as garden annuals in beds and borders; pots, containers, window boxes, hanging baskets; houseplants. 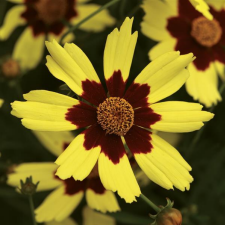 Finally, the fifth new annual for 2019 is one of my favourites—a Tickseed (Coreopsis hybrid Electric Sunshine). This beautiful new Coreopsis is a real stunner in the garden. Flowers beautifully from spring until late-fall in a non-stop display of colour. Allow plenty of space for it to achieve its full glory. It is self-branching, with excellent vigor. Now here is some, what I consider not-so-good news. Humber Nurseries on Highway 50 in Brampton are closing for good at the end of this year! This is just a news flash and I’ll have more in the coming weeks.